Schroder and her mentor, associate professor Flora Meilleur, at the Oak Ridge National Laboratory in Tennessee where they conduct their research on fungi enzymes and their usefulness to break down cellulose and (potentially) make affordable biofuel. A unique CALS opportunity drew Ph.D. student Gabriela Schroder the whole way from South Africa: the chance to work with associate professor of biochemistry Flora Meilleur on one of the best neutron sources in the world. Gabriela Schroder encourages students not to be intimidated by biochemistry. It’s “like looking under the hood of a car,” she says. 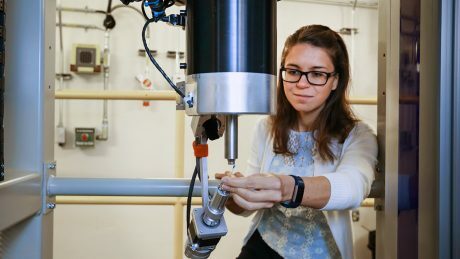 Now in her fourth year in the Department of Molecular and Structural Biochemistry, Schroder works with Meilleur at Oak Ridge National Laboratory in Tennessee. It’s one of only a few national laboratories that supports a user program for basic research using neutrons. 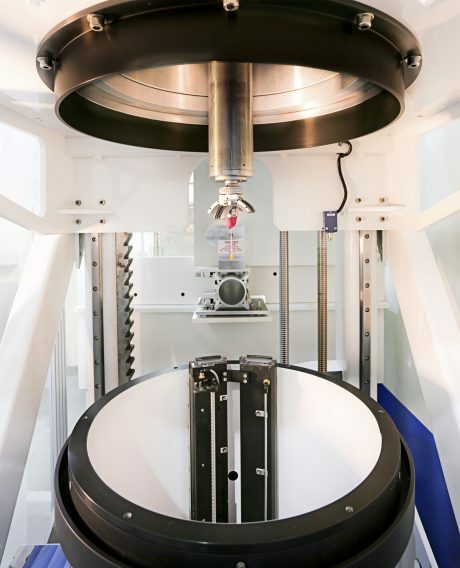 Schroder uses neutron diffraction to suss out the structure of proteins, hoping to decipher how to harness them for everything from biofuels to better medicine. Here, she talks about what that process looks like day-to-day – and why she loves it. What got you interested in biochemistry? It’s like taking apart a little machine. You’re looking at chemistry happening on such a small scale; the elegance of something so complex being solved by nature really excites me. Sounds like you love your work. When you’re trying to understand something that’s alive, it’s quite an adventure. You learn so much along the way about how an organism grows, about its metabolism – it’s day-to-day learning and problem-solving. Why is it important to get the rest of the world interested in biochemistry? Our society faces many challenges related to the environment and health, to name just a few. These challenges are often interlinked on a larger scale, even if we don’t realize it. Understanding something at the basic level … may help us understand and improve the system as a whole. Do you need to be really, really smart to be a biochemist? 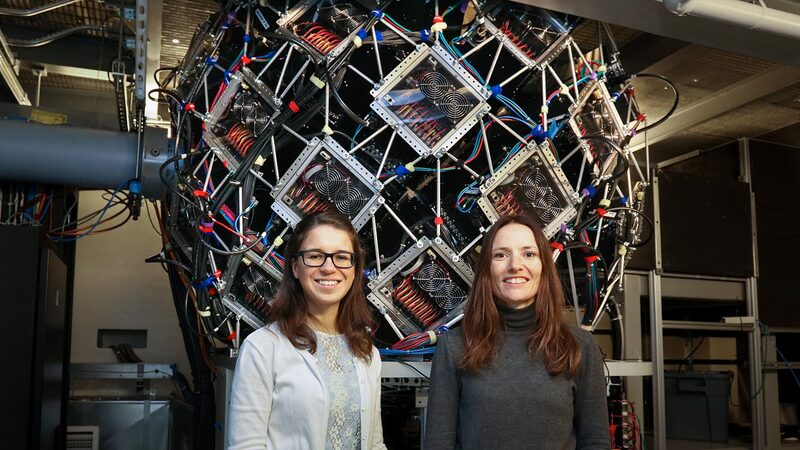 Associate Professor of Biochemistry Flora Meilleur and her Ph.D. student, Gabriela Shroder, working on one of the world’s largest sources of neutrons at the Oak Ridge National Laboratory in Tennessee. You just have to be interested and curious. What deters people from biochemistry is that at the beginning … it looks like a lot of memorization. It’s intimidating. As a biochemist, however, you are aware of the bigger picture, but you don’t memorize all of it. You focus on one little piece of the puzzle and try to understand that piece more deeply. It’s not a scary field at all. There’s a wonderful logic to how all these systems fit together and how it all works. Basically, we’re structural biologists; we look at protein structure. Proteins are the workhorses of the cell, a very effective system developed by nature to keep our cells alive and growing. What’s unique about what we’re doing is that we’re analyzing structure using neutron diffraction. What protein types do you study? We study two proteins that both contain metals in their center. We look at their structure and how it influences chemistry. It’s basically like looking inside the hood of a car and seeing what’s positioned where and trying to understand the consequences. One protein I’m very interested in is cytochrome P450, which is ubiquitous in all life forms because it catalyzes oxygen insertion. … It’s very important for the biological processes of breaking things down or synthesizing new biologically relevant compounds. … The other is lytic polysaccharide monooxygenase. It comes from a fungus, and increases the efficiency of converting cellulose into chemical products such as bioethanol. Why use the neutron diffraction method to study those proteins? Water plays a central role in the myriad of reactions taking place in the cell catalyzed by these proteins. This is where the neutrons come in: They allow us to visualize water, particularly what the hydrogens are doing during these reactions. … The hydrogens tell us what’s happening on an atomic level and what can be tweaked. I’m interested in not only what a protein does, but how one can change that and improve it. If we shadowed you for a day, what does it look like to do this kind of research? One of the cutting-edge instruments Schroder and Meilleur use at the Oak Ridge National Laboratory in Tennessee. “I’m interested in not only what a protein does, but how one can change that and improve it,” Schroder says. In pictures, biochemists always seem to have little test tubes; it all looks like these mysterious clear liquids, but what we’re trying to do is get as pure a form as possible of [proteins] and make crystals out of them to analyze, particularly with neutrons. There are different stages. In the beginning, you’re doing a lot of hands-on lab work: we grow bacteria to produce the protein we are interested in. You’d see a lot of work with flasks and incubators, as well as purification systems to get purified proteins. Once you’ve worked hard to get a sample and collect a good data set, a lot of time is spent analyzing the data. This involves lots of computer-related work to understand what you’ve found. What impacts might we see from your work in the future? Before industry or pharmaceutical companies can produce something, they need to understand things at their most basic level. That’s where we come in. As researchers, we generally seek to elucidate the fundamental principles of a system. In biochemistry, if we can work out the mechanisms behind the reactions catalyzed by proteins in the body, or how fungi feed on cellulose, it makes it more likely that we can change the system to have more desirable effects. For example, with cytochrome 450, if we can further understand how they work, we could understand the body’s interaction with drugs better and help improve drug design.